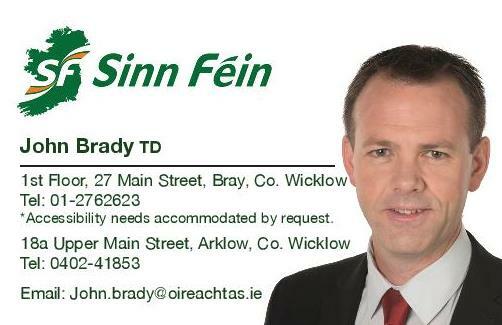 Sinn Féin TD for Wicklow/East Carlow John Brady TD has announced dates for his upcoming public meetings ‘Save our Health Service’ to be held in Arklow and Baltinglass. “I am delighted to be rolling out public meetings to discuss the health service in Arklow and Baltinglass. “At a time when every sector of our health service is in crisis I feel it is important for the people of Wicklow to have their say on their health service. “The ongoing trolley crisis and waiting list scandal has put health firmly back on the political agenda and this cannot be lost. In Wicklow alone, there are 9,811 people waiting on an Outpatient appointment. “This meeting will give people an opportunity to share their views on the current health service available in their own area, the concerns that need to be addressed, as well as a vision for our health service going forward. “The need for a 24/7 ambulance service to be in place in both Arklow and Baltinglass is central to the health service in both towns and this must be delivered. “Sinn Féin has embarked upon nationwide outreach on the need for an Irish National Health Service. “This engagement is part of a process to highlight to people the system that they should be demanding of their elected representatives, that puts their health firmly at the centre of health deliberations, irrespective of income. “Speakers at the public meetings will include Louise O’Reilly TD who is Sinn Féin Spokesperson for Health and Liadh Ní Riada MEP.